Can a Christian marriage survive an affair? Yes, mine did! When Ron and I got married in 1978, both of us believed that it was the other person’s job to “make me happy.” We soon found out that was impossible. I complained and criticized my way through our first year. Then Ron retaliated with the “I’m a bad husband because you’re a bad wife” defense. Our anger and resentment grew until it overshadowed our love. That’s when I met Jake. He thought I was beautiful, funny, and smart. He only saw the good in me and bathed me in compliments. We worked for the same company so it was easy to spend time together. We started meeting for lunches, then dinners, and eventually—dessert. In June of 1980, I told my husband what he already knew: “Our marriage is falling apart . . . we’re both miserable.” Then I surprised him with, “So, I need some time to think—I’m moving out.” I didn’t tell him about Jake. He begged, “I won’t yell at you anymore . . . I’ll be a better husband . . . we’ll start going to church again . . . please don’t go.” I ignored his pleas and moved into a hotel. Jake and I started making secret plans for our future. He was married and had two children, but he was going to leave them—for me. I purposefully kept my Christian parents in the dark about my marriage problems. My mother had a connection with the Lord that made me nervous, and I was afraid she would “know” there was something wrong. Since they lived in a different state, I was able to keep my secret . . . for a while. “Sure, Mom, I’m fine,” I lied. I am in trouble now, I thought. I’ve never been able to lie to my father. I was sure they were waiting for me to say it, too. But I knew that amen meant “Let it be so,” and I wasn’t sure I wanted what he’d prayed for. The thought of giving up my relationship with Jake seemed unbearable. I said, “Thank you, Daddy . . . Mom . . . I’ll wait for Ron. I’ll call you in the morning. Good-night.” Then I hung up the phone —fast. Their prayer began to soften my heart and I wondered if there was any way out of the chaos I’d created. I went into the living room, sank into the sofa, held a pillow to my chest, and called out to God. I had been avoiding him for months. My guilt, shame, and sin had built a wall between us. But, brick-by-brick, as I confessed each sin, I tore down the wall and let the Light in. I prayed, “Lord, please show me your will for my life.” Then, I remembered the simple words that Jesus said to the adulteress: “Go and sin no more.” I knew exactly what I had to do. I surrendered my will and my heart to the Lord and asked for the strength to walk away from Jake and make a full confession to Ron. When I told my husband the whole truth and asked for his forgiveness, he miraculously chose to forgive me. We both called Jake. I cried as I apologized to him and explained why I had to quit my job and why I could never see him again. Ron and I asked him not to call or have any further contact and he agreed to honor our request. I told him that I hoped he would reconcile with his wife and restore his family. When we said good-bye, all three of us were crying, for three different reasons. My feelings for Jake had not changed; I was still “in love” with him. But I chose to stay with my husband. My feelings for Jake had not changed; I was still “in love” with him. But I chose to stay with my husband. It was out of obedience at first, but as I began to act lovingly, the loving feelings eventually followed. Ron and I recently celebrated our 39th wedding anniversary and I am thrilled to tell you that we are deeply and tenderly in love—with each other! We are living proof that no marriage is beyond repair. 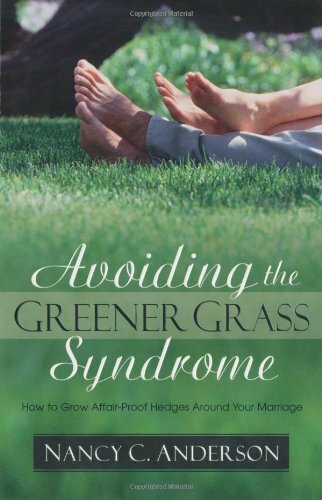 Adapted from Avoiding the Greener Grass Syndrome: How to Grow Affair-Proof Hedges Around Your Marriage (2nd Edition, Kregel Publications, 2017).